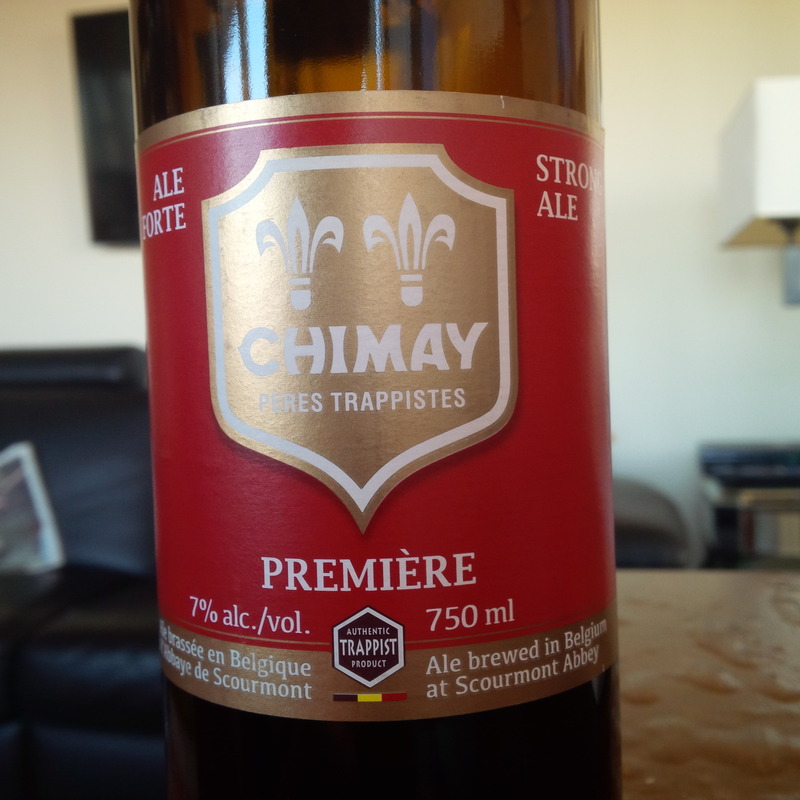 Chimay Première (Rouge) – Is It A Great Beer? Chimay is a legend, one of the select Trappist beer group, or beer brewed by monks of the Trappist order within the confines of the monastery. It was and probably still is the best known Trappist beer, as well. The Notre Dame abbey at Scourmont, near Chimay (a town) in the wooded Hainaut of Belgium, has made beer since the 1860’s. Chimay was an early import to North America (from the 1970’s) and helped influence the craft beer revival here. Writers such as Michael Jackson wrote lyrically about the beer, and Trappist brewing in general. This caused a wave of interest in Belgian brewing which is unabated to this date. I first drank Chimay Rouge, 7% abv then as now, in about 1980, in Montreal. A restaurant in Old Montreal, with flagstones dating from the French Colonial era, carried it. To my best recollection, it was herbal and aromatic (perfumed), but whether similar to the beer today, it is difficult to say. In checking books both in English and French of the same period, there are few really helpful sensory descriptions. Michael Jackson used different terms in his books, such as blackcurrant, which can mean funky-vegetal, juniper, spicy, red fruit, but it is hard to pin down the palate from what he wrote. James Robertson, in his circa-1980 The Connoisseur’s Guide To Beer, said it reminded him of his Aunt Beenie’s root beer, which is one of my favourite beer descriptions of all time. Root beer suggests a sweet and wintergreen or minty/herbal taste. I don’t find Chimay today like that, but again it’s hard to know what Robertson really meant. As many beer fans know, Chimay is not an all-malt beer. It uses something like 15% wheat flour or wheat starch – accounts vary, but either is an adjunct – and 5% dextrose. The brewery says the beer has not changed since the 1940’s when famously, the yeast was isolated which is used in the brewing to this day. It is a strain which performs well at high temperatures and flocculates well, or drops in the bottle so the beer will look clear. Still, 80% malt is certainly respectable, similar to what British ales were using in the period before craft brewing from America impelled some British brewers to brew all-malt. Thus, it seems Chimay was not all-malt in 1980, although some doubt persists. A factor which may have affected the palate more was the move, in the late 1980’s, to cone-tipped cylindrical fermenters. Prior to that, the beer was open-fermented as the Westvleteren beers, from another renowned Trappist brewery, still are. Some have speculated the behaviour of the yeast changed in the different vessel and altered the palate. What does Chimay Rouge, best known of the three beers in the Chimay range, taste like today? It is fruity, as in cherries or plums, and rather light-bodied, with a strong, bready yeast smack to it. The yeast taste is one which many who know Belgian beer will recognize. It is like the smell and taste of a fresh cork, a cork not long in the wine bottle. I used to think the cork in the tall bottle version of Chimay imparted the taste, but it tastes the same from the skittle-shaped bottle closed with a cap. As other Belgian ales have a similar taste, e.g. Leffe, whose recipe originates in monastic brewing, it is the yeast which is at work here. The next time you have Champagne, see if you don’t notice a resemblance in the yeast background. I always felt that a wine yeast, possibly from Champagne, a region fairly close to Wallonian Belgium, may have been used to help isolate the Chimay yeast. Wine yeasts are adapted to fermenting wine at alcohol levels of 10-12% abv and more. Chimay’s beers are not quite wine strength but are much higher in alcohol than the typical ale of the mid-20th century which was 4-5% abv. In the last 20 years, I find this yeast taste overwhelming in Chimay. It dominates the palate strongly, with malt and hop flavours playing a supporting role. I don’t find the flavour particularly attractive. For example, there is a scent of fine flowery hops in the beer, I’d guess English ones for recent brewings anyway, but that taste is almost submerged under the yeast dominance of the beer. Someone once suggested to me that Chimay is much better when aged a few years, that the yeast taste breaks down and the malt and hop flavours come more to the fore. I may lay a few bottles away and test the idea. I’ll leave the reader with a final reflection. About a year ago, I had a bottle of Westvleteren Abt, the legendary Trappist beer from another monastery in Belgium. I hadn’t had Chimay prior to this tasting for a few years. PBR Under The Gaze Of Beer Et Seq. I really like this brew… It’s actually one of the reasons I started homebrewing (massive student debt, imports are pricy, it’s bottle-conditioned). It isn’t as flavourful as some, but certainly digestable as a Belgian should be. It is great with food! I was looking again at James Roberston’s book mentioned (1982 edition). Apart from what I said above about Aunt Beenie’s root beer, Robertson did state Chimay had a “sweet apple bubble gum” aroma. This would be an estery, high-temperature fermentation odour and taste. Whether the current beer has this taste is open to question. Robertson mentions the version of Chimay only vaguely, but his description seems clearly to point to the red label, or Rouge version, not the stronger blue label Chimay. Although, they are not that different in taste, IMO.